This month’s GGG book, chosen by the oft-mentioned Skye ( 🙂 ) was The Year of Living Biblically, by A.J. Jacobs. Skye picked it because she had read The Know-It-All by the same author and loved it. Not all the gals who made it to the meeting had finished the book, but we were all able to say that it was eminently readable, entertaining, and thought-provoking. Those of us who haven’t read The Know-It-All now plan to. 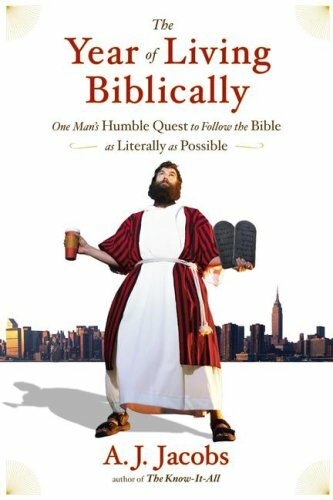 In The Year of Living Biblically, the author takes a year to live following the rules/advice of the Bible as closely as possible – part of the time based on the Old Testament (Talmud) and part on the New Testament. The task is epic: there are hundreds of rules, all open to myriad interpretations. Hey A.J., if you are still in the habit of Googling yourself and happen to find this blog, we’d like to officially say Bravo! We loved your book, and props to you for taking on such a gargantuan project. We found it hilarious even though you never disrespected the process, and we admired your chutzpah in many an awkward situation. We were impressed with your thoroughness and your open-mindedness. As with Greg Mortenson, we are not sure we would want to be married to you… but we’re glad you included your wife in your story and we give her props for her tolerance/support. It’s one of those books you want to dog-ear. (Some of us did.) So many little paragraphs that need to be read aloud, or re-read to oneself, because they’re so wise or funny or true or eye-opening. For example, Skye had dog-eared the part about stoning adulterers, because it had made her laugh until tears streamed down her face. Many of us took note of the part about honesty – it makes you look at your daily life and how often we aren’t honest. the part about the shaving of the beard. I can relate to the feeling of having a life-changing, personality-altering haircut. I loved the part about the Hasidic dance party – as previously mentioned, I’m a firm believer in the joy of dance. I found fascinating the parts about animals and sacrifices – it reminds us how removed we are from the bloodiness that our ancestors lived with. I got a great kick out of reading the part about the gay fundamentalist Christians – it just goes to show. I enjoyed the part about crazy ex-uncle Gil, the cult leader – skilfully written, with no direct incrimination or bad-mouthing of this arrogant, self-obsessed weirdo… just a simple account that shows it like it is. 1. Greenberg tells me, “Never blame a text from the Bible for your behavior. It’s irresponsible. Anybody who says X, Y, and Z is in the Bible – it’s as if one says, ‘I have no role in evaluating this. '” This hits the nail on the head. The fact that people use their so-called religious beliefs to justify their nasty attitudes is one of the major problems with humanity. IMHO. 2. A.J.’s response, at the end, to the question of whether he believes in God. He puts beautifully into words thoughts I’ve been trying to pinpoint for a long time. So, to sum up: GREAT STUFF. I honestly think I would recommend this book to every person I know. We would all get something out of it. I’m about a hundred pages in and enjoying it. I just read the part about “debt-forgiveness” and the 7 year cycle and how some people are working to get industrialized nations to apply this idea to third-world debt. Now THAT’s a good idea, and a “because the Bible says so” that I can get behind. Oh… and I bought the next book already, so there’s a very good chance I’ll get it read this time! Yay! Bang read it and enjoyed it. I liked when he’d read bits and pieces out loud that struck him as interesting or funny.